some question how the islands will retain their local flavor. On the day of the big announcement, Carol Pregill got a call and a fax. Macy's phoned, then faxed her a press release describing its purchase of Liberty House. It was very nice of the company to think of her, Pregill said. After all, Pregill is the executive director of the Retail Merchants of Hawaii, and Macy's will be the trade association's newest member. But, personally, Pregill is torn. She has friends who work at Liberty House who may be out of a job. She has worked part time for Liberty House several times, once in the men's fragrances department in Pearlridge Center. "I've really been wrestling with this," said Pregill. Possibly by Christmas, all of Hawaii's Liberty House stores will be replaced by Macy's, in a common corporate merger. On one hand, Hawaii's consumers will be refreshed with prices and customer service gleaned through modern corporate efficiency. The state's famously expensive cost of living gets that much more affordable, for everyone. On the other hand, several hundred well-paying retail management and office jobs could be lost at a time when Hawaii's economy is looking downward, again. "There are winners and there are losers," Pregill said. "That's unfortunately the worst fallout of this kind of changing economy." But lost jobs are not the only consequence. Fewer management positions in Hawaii ultimately means there will be fewer local leaders here, says a prominent economist. Still, said Leroy Laney, you can't stop the roar of efficiency and consolidation in a market economy. On the whole, balancing prices with jobs, Macy's is a good thing for Hawaii, Laney said. It's all the more reason, however, to encourage the creation of good jobs in newer industries, such as high technology. Meanwhile, Pregill isn't the only local observer concerned with the loss of upper-level jobs at Liberty House. University of Hawaii officials wonder what will become of the 30-odd students who graduate every year from the university's Apparel Product Design & Merchandising program, formerly known as Fashion Design & Merchandising. The retail program has graduated many Liberty House managers over the years, said Barbara Harger, chairwoman of the Department of Family and Consumer Sciences, a human resources studies branch at the UH-Manoa campus. Particularly popular among students these days is the position of retail purchasing agent, more commonly known as a buyer. Liberty House currently has 40 buyers statewide. 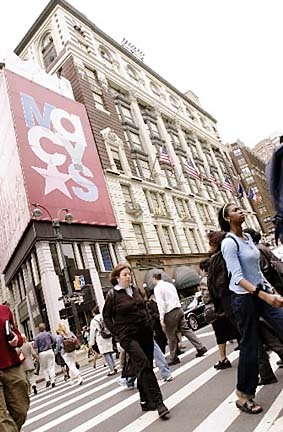 In their place, Macy's plans to appoint a single team of buyers, of undetermined size. The company said it will interview locally and on the mainland for the jobs. The team will be responsible for selecting products with an appropriate island-style flavor, which doesn't necessarily mean made-in-Hawaii. Jobs for buyers have been dwindling in general, Harger said. Fewer retailers are buying Hawaii-made products. "It is moving jobs out of town, unfortunately," Harger said. "Many of our students would like to be buyers and there's going to be less opportunity for them to do that in this town." Making matters more difficult, Hawaii's retailers are suffering declines in tourists from the mainland and the Asian market, Pregill said. Last year, a banner year for the visitor market, there would have been jobs available to displaced employees of Liberty House. This year, it's going to be different. "All the retailers are tightening their belts now," said Pregill. "I don't think there are openings readily available." If the jobs aren't there, retail students will either change careers or end up on the mainland, Harger said. But things might not be so dark. Macy's has a good corporate reputation, Harger said. She hopes the company will continue the retail internship program that her department currently has with Liberty House. "Every bit helps," she said. For its part, Macy's is doing what it can to ease the effects of change on Liberty House. There will be layoffs here, but the company has made an effort to keep positions open on the mainland for former Hawaii employees. Macy's West, a chain of 117 stores owned by Cincinnati-based Federated Department Stores Inc., has 28,100 employees. In the late 1970s, Liberty House stood face to face with Macy's in downtown San Francisco's Union Square. It was all-out retail war. At the time, then-Liberty House owner Amfac Inc. ran 92 retail outlets nationwide, with 6,000 employees. A few years later, Amfac began divesting all of its mainland stores. Now, Macy's has officially won. What happened to the former Amfac mercantile dynasty is debatably a mirror of what has happened to Hawaii in the past couple of decades. A bustling community of locally owned companies has given way to renowned mainland brands: Kmart, Safeway, Wal-Mart, Borders, Home Depot, Ross, Costco, Nine West, Sam's Club, Old Navy, Banana Republic, Gap, Lowe's, and now, Macy's. Several local retailers remain, to be sure. To name a few: Crazy Shirts, City Mill, Hilo Hattie, ABC Stores, Hawaiian Vintage Chocolate, Lamonts Gift and Sundry Stores, the Sultan Company and, appropriately, Endangered Species. One person eager to greet the new Macy's stores in Hawaii is Pat Loo, whose local union represents hundreds of retail workers in Hawaii, including many at Ala Moana Center, but none at Liberty House. Loo is president of the Local 480 of the United Food & Commercial Workers Union. The union has a longstanding relationship with Macy's stores on the mainland, covering salespeople, stockers, display workers and support functions. While that relationship doesn't automatically cover Hawaii, the union will soon look into organizing new Hawaii employees, Loo said. Keeping all of Liberty House's senior management and administrative positions isn't possible, Macy's says, because it would only duplicate posts on the mainland. Operational efficiency is key, because it allows Macy's to pass savings along to customers, said Laney, professor of finance and economics at Hawaii Pacific University. That's no small point, considering that Hawaii's high cost of living is one of the reasons it is hard to run a company here. "Our graduates are going to be consumers also," Harger said. She can see both sides of the issue. Part of that high cost, however, is Hawaii's paradise tax, the tradeoff for living in the warm, sunny islands, Laney notes. "I think it'll always be the case," he said. The Liberty House-Macy's merger should also be viewed as part of a larger national trend toward industry consolidation, observers said. "We've escaped a lot of it here," Pregill said. But those days are over. "It doesn't make it right. It doesn't make it better. It makes it reality," she said. The trend was last illuminated locally when the San Francisco-based parent company of Duty Free Hawaii was bought by Paris-based luxury-goods maker LVMH Moet Hennessy Louis Vuitton SA for $2.5 billion in 1996. Two years later, hit by a slowdown in Asian tourism, DFS Hawaii fired 300 of its 1,660 Hawaii employees. Management workers were the most heavily affected. Corporate consolidation isn't isolated in the retail sector. Hawaii has also been hit in the fast-changing telecommunications arena. Dozens of radio and television broadcast jobs have been lost locally over the past five years when mainland companies snapped up all of Hawaii's top stations -- a move spawned by the federal Telecommunications Act of 1996, which released restrictions on media ownership. Also on the tele-communications side, about 90 local administrative jobs were cut after AT&T Wireless bought the former Honolulu Cellular Telephone Co. a year ago from Atlanta-based BellSouth Corp.
AT&T Wireless, seeking more efficiency, shifted all finance, purchasing, marketing and billing jobs to central mainland locations. The company kept its total number of Hawaii employees the same -- just under 300 -- by hiring generally lower-paid call-center employees, credit checkers and assistant managers for its retail cell-phone stores. Hawaii has only more mergers in the future, observers say. One frequently mentioned candidate is the Honolulu-based parent company of Bank of Hawaii, Pacific Century Financial Corp., which has been cleaning up its books and shedding assets since banking executive Michael O'Neill stepped to the head of the bank in November. O'Neill paid a key role in the 1997 sale of Bank of America Hawaii to American Savings Bank. To stock analyst Bob Patten, the cleanup of Bank of Hawaii is proving attractive as an acquisition target, as well as beneficial to current shareholders. "It's a potential target," said Patten, an analyst with UBS Warburg. Conversely, O'Neill has dismissed those reports, saying the bank has gotten far more expensive to sell, given that its stock has more than doubled to $25.24 a share as of Friday's close, from $11 in October. Regardless of what company is next, the implications remain for Hawaii. Fewer managers mean fewer corporate citizens and future leaders, said Laney, an economics professor at Hawaii Pacific University. "There will be fewer local leaders who take on local projects," Laney said. "This could cut good or bad, but what it will mean is that a lot of the business functions we see here will be run offshore." Maui and the Big Island once had powerful local leaders, said Laney, who has surveyed the economies of the neighbor islands for the past 12 years. "That went by the wayside several decades ago," he said. "There are several people that lament that." A local boss has a local conscience. If the powers-that-be in the state are outsiders, any social problems would become less visible and less easy to address. "It's sort of out-of-sight, out-of-mind," Laney said. That's precisely why Hawaii must focus on building new industries, said Dennis Vanairsdale, chairman of the Business Education Department of Kapiolani Community College. Certain niches of the high-tech industry -- software development, language translation -- could prove fertile ground in Hawaii, he said. High-tech jobs in Hawaii have increased an average of 4.3 percent a year since 1994, rising to a total of 8,353 in 2000 from 6,653 in 1994, according to a recent national study from the American Electronics Association, now known as AeA. Hawaii may not be able to compete in certain industries, such as manufacturing, but when it comes to intellectual content, there's no excuse, said Vanairsdale. He's trying to make his students realize that jobs are changing. An accountant by trade, Vanairsdale used to keypunch financial data around the world through satellite relay. Today, all you need to achieve the same result is one person on one computer. Corporate efficiency always eliminates old jobs, and new jobs emerge. "It has to do with lifelong learning," he said. "It has to do with good basic skills, plus technical skills."